Hello. My name is Dr. Stuart Gold and for the past 23 years, I have practiced orthopedic surgery. During that time, I have performed over 15,000 operations on patients who suffered from pain and joint discomfort - related to problematic shoulders, necks, knees, wrists, backs, hips and ankles. During my career, I have seen the traditional approach to medical care transform. As a result of that transformation, patient concerns are often neglected and patient choices can be misguided. 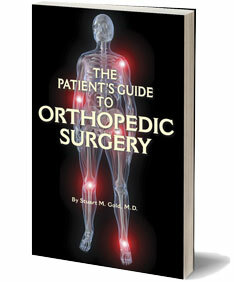 For this reason, I wrote The Patient's Guide To Orthopedic Surgery to help future patients and their caregivers.